As time passed people would come and go. Some for longer periods; some for shorter. As explained above, my extended family decided to put the estate on the market but I could only raise a mortgage for the land and one of the cottages. Sadly, I’d had to let the thatched cottage go. But apart from the various lodgers I had in the remaining tiled cottage, I also occasionally had people in caravans and camper vans down in the meadow. 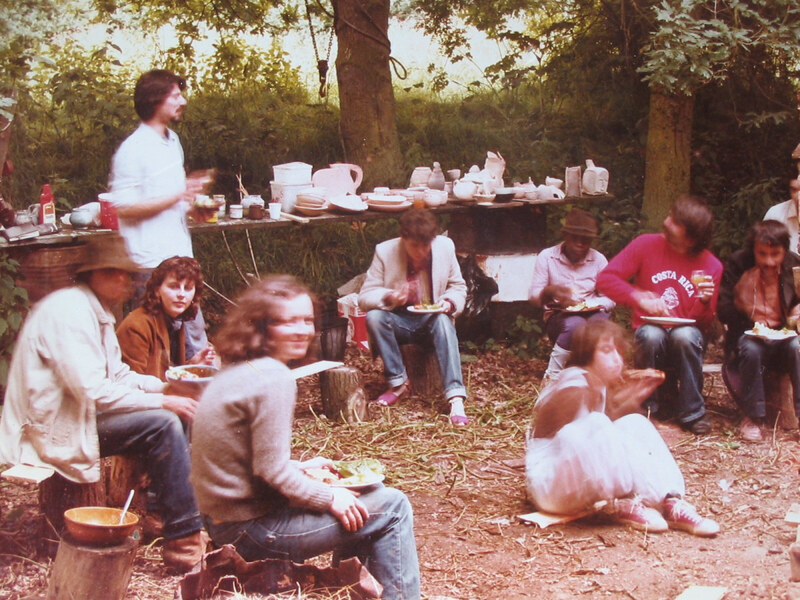 I was often working at jobs elsewhere – Cambridge, Watford, Chichester – and only returned on weekends and holidays and extended bouts of unemployment. 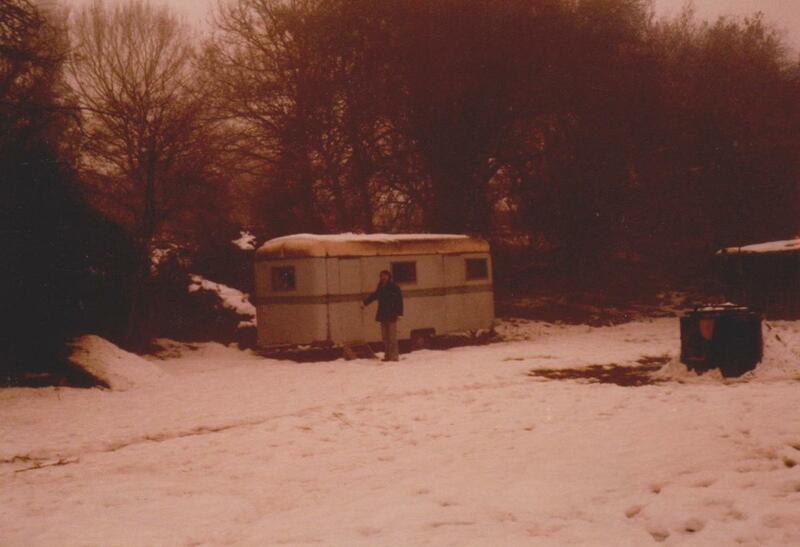 On those occasions I had my own 1950s caravan in the lower meadow as my primary residence. Most of these people were perfectly nice, but didn’t quite have the profound affection for or sense of potential in the land that I seemed to have. As a result, I didn’t often have enthusiastic co-workers in the various projects and undertakings I had underway. People were generally so “laid back” that things rarely got done. So, a lot of my time in the meadow and among the trees was spent on my own. One day I decided to rationalise the Nissen (Henderson) hut at the bottom of the field where it rose up gently to the west. Years previously I'd played there with siblings and cousins and even, at one time, became convinced that my Gran had kept pigs there. Now it was much damper and mustier and the heavy arched corrugated steel sheets were rusting through in so many places that tiny shafts of natural light seemed to illuminate just about everything. Brambles and elder had crept though various openings such that the interior was easily as entangled as the immediate exterior. The corrugated sheets were held up not just by the thick end brick walls, but also by an equally thick internal brick wall with no openings. You couldn't get from one end of the hut to the other without going outside,but the walls and the solid concrete floor were really all that was usably left. I think he moved in later that day and over the next few days bricks began to appear in the little clearing. He was cycling everywhere so, in the course of carrying on with his studies at the college, he was bringing them in piece meal (from god knows where) and hauling them over to the clearing by hand. Eventually he reckoned he had enough and started stacking them up, without mortar or cement, into a strange elongated sort of oven with a tall, unstable looking chimney at one end. He dug up a few buckets-full of clay from the dip at the end of the lower meadow and lugged those up to the clearing as well. Friends of his, other aspiring potters from the college, began to appear on site to see what he was doing. Eventually, he announced to all concerned that there would be a raku firing on the following Friday night and everybody would be welcome. He then set about creating an enormous curry (he was also a brilliant cook) which he hauled over to the clearing on the Friday and placed on a trestle table he had bodged together. As evening approached, people gathered and were encouraged to make things out of the clay he had on hand. We all stood and squatted around making shapes like a bunch of children. In due course he took them and placed them carefully within his pile of bricks, along with a small stack of firewood. As darkness settled in, he lit the wood and we were treated to the vision of long flames licking along and up through the brick. Wali kept stoking that fire and the flames, visible through the gaps in the stacked brickwork, began to spark and flare right out the top of the shakey chimney. It was wondrous, like some gasping spitting fire beast lying there on the clearing floor and struggling to get up. We stood in charmed silence as the darkness deepened and the fiery vision intensified. As the fire settled down and the bricks began to glow, Wali began to serve the curry and we all ate and chatted animatedly as the kiln did its work on our clay contributions. Much later, long into the night, the fire had more or less burnt itself out and Wali produced a pair of iron tongs and began dismantling his still radiating work of art and carefully retrieving the various clay shapes. Now properly fired, they were pieces of hot pottery and he placed them in a line on a plank for all to see and admire. It was a miraculous transformation. Hardened bits of proper ceramic, more or less straight out of the ground. Wali became my good friend and co-conspirator on a wide range of activities. The fact that he could, seemingly effortlessly, cook up a storm meant we had more dinner parties and this in turn encouraged more collective activity. Our mini-festivals took on a new character with the raku kilns becoming a main attraction. And although I wasn’t particularly enamoured of pottery, I got drawn into his enthusiasm and we started carting his bricks around in my van and taking them to other festivals and fairs. We would arrive on site, disgorge the bricks, and stack them up into different configurations of kiln (Wali was always experimenting), and invite people to create shapes out of the raw clay. They would all come around later in the day to see the dramatic steam punk kiln do its thing, firing sparks high into the darkening sky, and duly retrieve their own handiwork when it was all over. At the end of the weekend, after the bricks had cooled, we would stack them back into the van before heading home. It was a very labour intensive operation. 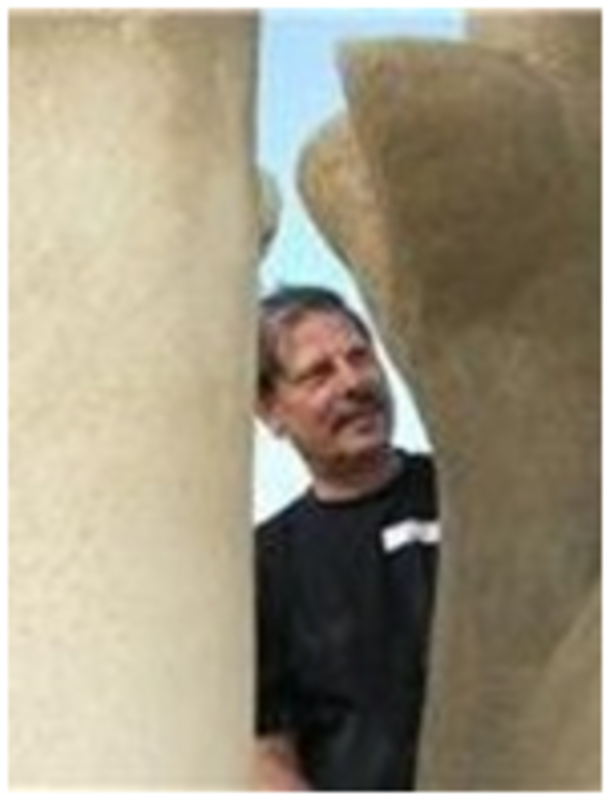 Wali went on to become a bit of an international star with his kiln buildings and raku firings. He fell in love with a Catalonian fellow ceramicist, married her, and moved to Barcelona, and later to Japan. He would get invited to ceramic gatherings all over the globe to fire up his creations. From time to time I would be sent photos of the larger and more complex beasts he was creating, complete with enthralled audiences watching in wonderment. We used to meet up occasionally whenever his orbit passed near enough. London, Barcelona, Amsterdam. In 2013 he decided to abandon his workshop enterprise in Nagoya and move back to England. 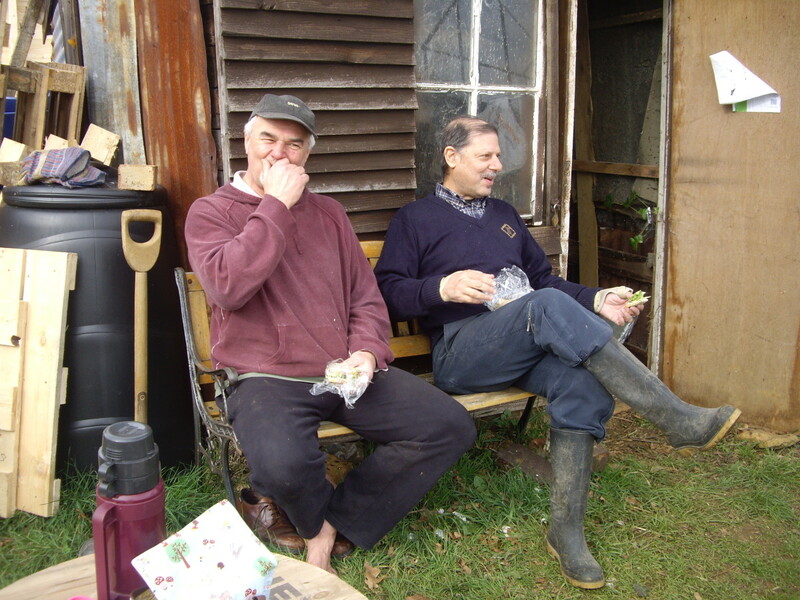 He came and stayed and helped me bodge a shed and we talked about reinvigorating activity on “the estate”. In July 2014 he was diagnosed with cancer. He died on August 6th. I was devastated. Still am. Badly miss him. "Wali Hawes, the father of my children, has died. He was born in India but lived in many countries; now a devastating cancer has taken his life away. As a potter he made kilns to fly, firing pots in the sky. 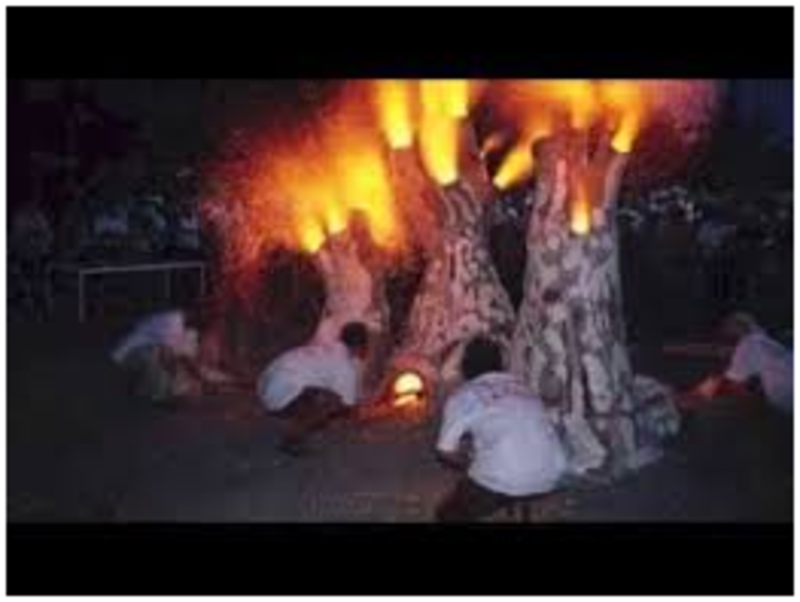 He created trees that had roaring fire flames. I’ve seen how people that participated in his projects were enlighted with emotion, with a happy glow in their hearts for those magic moments. He was an absent father for a long time, but at the end of his life he found that place for his sons. In his last days I saw his body destroyed, but not the anger that they told me. I saw serenity and a glow of love in his eyes. We had a farewell in peace. "Walker, there is no road, there is a path, as you walk, and when you look back you see the path that you do not have to tread again. Walker, there is no road, only the wakes in the sea."